It’s date night in Tacoma, and you’re in search of the perfect romantic outing. What to do? One of our favorite dates in T-Town combines some of downtown’s best features with ease of access. My wife and I find a parking spot at the University of Washington parking lot at the corner of South 21st Street and C Street. The hourly rates are reasonable, and the lot is typically half-empty in the evening. Then we enjoy a short, picturesque stroll through Gillenwater Plaza on our way down to Pacific Avenue. Once on Pacific, we take a sharp right and peer inside the restaurants that populate the 1900 block. The Indochine, the Harmon and Savory Creperie each has the potential to hit the spot, depending on our mood. After dinner, we cross Pacific and walk toward Union Station. If we’re feeling ambitious, we visit one of the museums clustered nearby: the Washington State History Museum, the Museum of Glass or the Tacoma Art Museum. 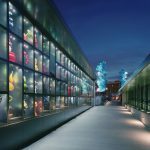 If we’re running low on funds or just don’t feel like committing, we wander to the Chihuly Bridge of Glass and take in the 500-foot long outdoor artwork or gaze down at the flow of traffic on I-705 below. We went on this date after first moving to Tacoma nine years ago, and we’ve been enjoying it ever since. Every time we visit, we feel like we’re new to town and once against just getting a feel for what Tacoma has to offer. Similar date nights can be had all over Tacoma, of course. At Point Ruston, you can dine at Wildfin, catch a movie at Century Point Ruston and stroll the waterfront trail. Feeling more casual? Drop by Steamers near Titlow Park and then stroll the beach afterward. If you’re a connoisseur of live music, enjoy a meal at Asado or Primo Grill, two of several highly rated restaurants in the 6th Avenue District, and then grab a table at nearby Jazzbones to catch a local or regional band. Tacoma offers all the amenities of much bigger cities: art, music, theater, dining, parks, beaches and a vibrant cityscape. But you can enjoy all of those experiences without getting stuck in traffic or fighting for an expensive parking spot. In short, date nights are a snap in Tacoma. You might enjoy this post about 101 Things to do in Tacoma. What’s your favorite date night in Tacoma? Feel free to share your thoughts below in the comments section. Chihuly Bridge of Glass photo courtesy of Horton Lees Brogden Lighting Design. Receive Tacoma community posts via email. We don’t spam. I read this article and found it very interesting, thought it might be something for you. The article is called Date Night in Tacoma and is located at https://www.thehumegroup.com/things-to-do-in-tacoma/date-night-tacoma/.